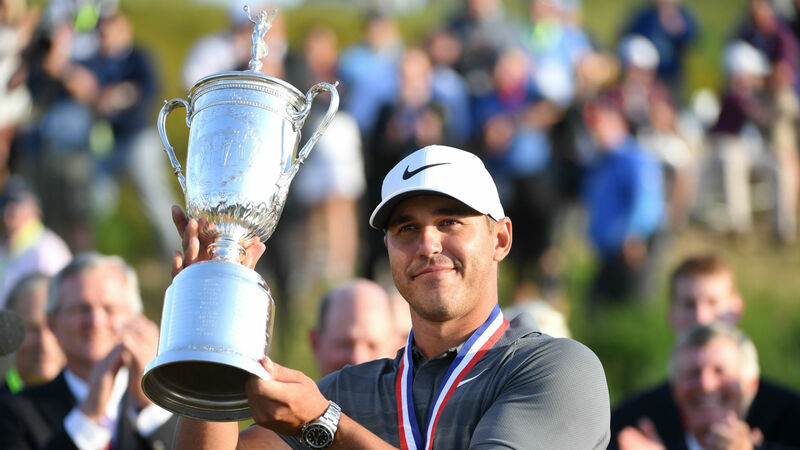 Brooks Koepka, who successfully defended his U.S. Open title in June and then won the PGA Championship in August, is the PGA Tour’s 2017-18 Player of the Year, the tour announced Tuesday. Koepka, 28, this year became the fifth player to win both of those majors in the same season, the first since Tiger Woods in 2000. The top shots from the top player this season. Koepka — the first player to successfully defend a U.S. Open title since Curtis Strange in 1989 — was selected over a group of finalists that included Dustin Johnson, Francesco Molinari, Justin Rose, Justin Thomas and Bryson DeChambeau. Johnson tweeted his congratulations to Koepka after he won the award, noteworthy given a reported altercation involving the Team USA teammates at the Ryder Cup. “Great season, bro,” Johnson said, in part.
? @BKoepka accepted his Player of the Year Award today. Coming off a wrist injury that sidelined him for four months, Koepka finished ninth in the FedEx Cup standings, a career best. In addition to his major victories, he had second-place finishes at the WGC-HSBC Champions and Charles Schwab Challenge at Colonial. He earned just more than $7 million this season. PGA Tour players who competed in at least 15 FedEx Cup events in the 2017-18 season were eligible to vote on the award.